Powder metal consolidation via hot isostatic pressing (HIP) is a cost-effective alternative manufacturing method to casting or forging. Traditional forging methods often result in parts requiring additional machining and welding to achieve the required finished dimensions. With Powder Metallurgy (PM) near net shape technology large components can be produced faster, with reduced weight and less machining. In powder metallurgy, hot isostatic processing is used to consolidate metal, ceramic, or composite powders into solid parts. With the application of pressure and temperature, the powder is compacted to create fully dense parts of semi-finished and finished products, including billets to be further worked by forging and rolling from which parts are machined. High purity and fine grain powders are formed (consolidated) into semi-finished product with minimal deterioration due to impurities, oxidation or grain growth (i.e. Sputtering Targets). Using the HIP/PM route materials and structures may be produced that are not available by more conventional (casting) techniques. 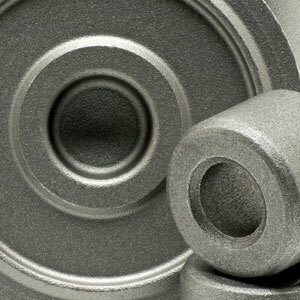 Parts with complex geometry are formed to near-net shapes, reducing input weight and machining/ finishing requirements. In some cases, powder is formed, consolidated and bonded to a substrate in one operation. Pre-sintered, powder injection molded (PIM) and metal injection molded (MIM) parts are pressed to full density using hot isostatic pressing for improvement of properties and/or to salvage the parts.